Microsoft CEO Satya Nadella received a compensation package for the year ending June 30 worth approximately $17.7 million, a 3% reduction from 2015, according to security filings. A preliminary proxy statement submitted Monday to the U.S. Securities & Exchange Commission showed that Nadella's pay cut was about a third of the 9% downturn in Microsoft's revenue during the same period. The chief executive received $1.2 million in salary, the same as the year before; $4.5 in a cash performance bonus, or 3% more than in 2015; and $12 million in stock awards, or 6% less. Unlike years past, stock awards granted in fiscal year 2016 to Microsoft executives, including Nadella, were not to vest simply because officials served time in the company. Instead, about half of the shares given to Nadella will vest in 2018 if the company meets a slew of targets, which range from revenue to subscriber counts. If Microsoft doesn't meet some or all of those goals, some of the performance-based shares will be forfeited. Fiscal year 2016 was the first during which Microsoft's top executives -- Nadella; Chief Financial Officer Amy Hood; head of business development Margaret Johnson; President and chief legal officer Brad Smith; and former Chief Operating Officer Kevin Turner, who left this summer -- were graded on a complex matrix of statistical targets. The board of directors made the changes after investors complained about too-broad ranges for bonuses and a lack of information about how directors evaluated the top tier. For fiscal year 2017 -- which will end June 30, 2017 -- the portion of executives' pay package tied to pre-determined performance goals is to increase from 40% to 50%. Some of Nadella's goals will be linked to the performance of individual units within the company and specific metrics of those units. In fiscal 2017, for instance, 11% of the "score" for Nadella's performance-based stock grant will be tied to the "monthly active device" (MAD) number for Windows 10, with another 11% pinned to the gross revenue for the Surface hardware line. Two-thirds of the score, however, will come from targets in commercial cloud revenue and the cloud subscriber count. Although Microsoft's new performance regime was spelled out in the proxy, complete with charts, graphs and even a formula for calculating Nadella's cash bonus, the document did not specify what each goal would be. 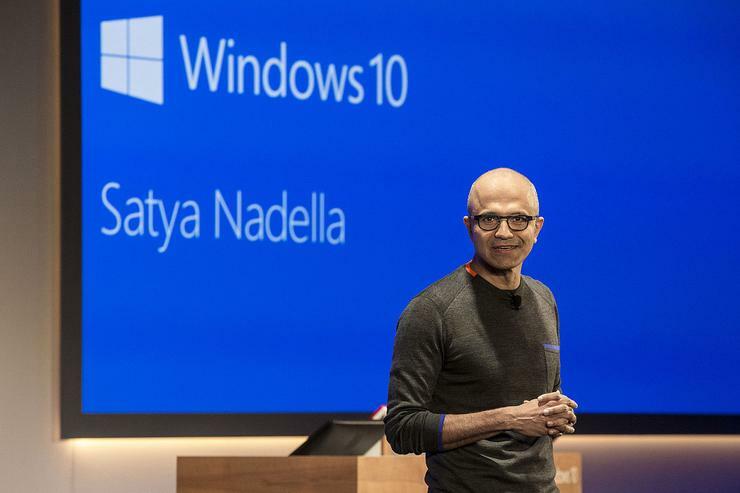 For the performance portion of his fiscal 2016 stock award, for example, Nadella was scored on that year's Windows 10 MAD: The target itself was not named. Windows 10's MAD during fiscal 2016 was one of the metrics that dinged Nadella's total performance assessment, and thus contributed to the modest reduction in his stock award. "Windows 10 MAD fell short of expectations for the year, in part because of the change in phone strategy, pushing the goal to achieve 1 billion Windows 10 MAD beyond fiscal year 2018," the proxy statement asserted in one of four sections of Nadella's evaluation. That section was the only not rated above 100%. Three months ago, Microsoft acknowledged that the 1 billion target was unreachable. At the time the company also laid blame for the shortfall on the smartphone business.